Click on for debate over the Rebellion, a post office fight gone religious, and of course, New Year’s festivities! On a brighter and more local note, the Canadian boatmen who had undertaken to accompany the British expedition up the Nile to try to relieve the siege of Khartoum were home, mostly safe and sound. As we have noted in previous editions of this series, this group, recruited by General Garnet Wolseley on the basis of his experience in dealing with Louis Riel’s first rebellion in 1870, included a number of men Peterborough. 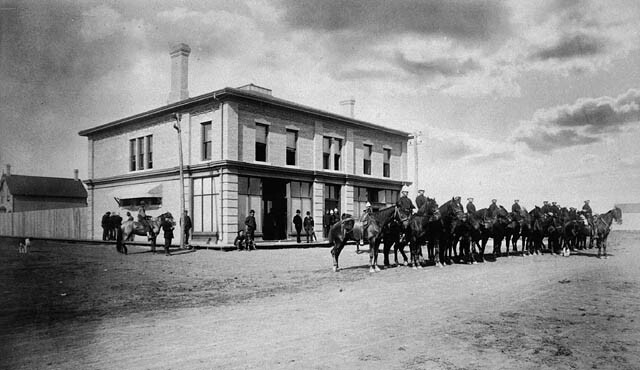 Sixteen Canadians died on the expedition, which arrived too late to save Khartoum and General Charles Gordon, commander of the British garrison there. The man whose forces took the city, Muhammad Ahmad al-Mahdi, had himself died in June of 1885, and sporadic fighting continued in the region. The big issue on the Peterborough scene in late 1885 involved the town’s yet-unbuilt post office, with the “yet-unbuilt” bit being the key. A contentious dispute had arisen over where the building was to be situated, with two groups vying for the right to make the lucrative land sale. Sectarianism then reared its ugly head — one of the groups, and the early favourite in the bidding, was composed of Roman Catholics, and their opponents called in the Orange Order for support. The result, according to reports in the papers, was that by the end of December of 1885, 40% of the original $15,000 budget for the project had already been spent in attempts to get one of the groups to back out, all without a single brick being laid. 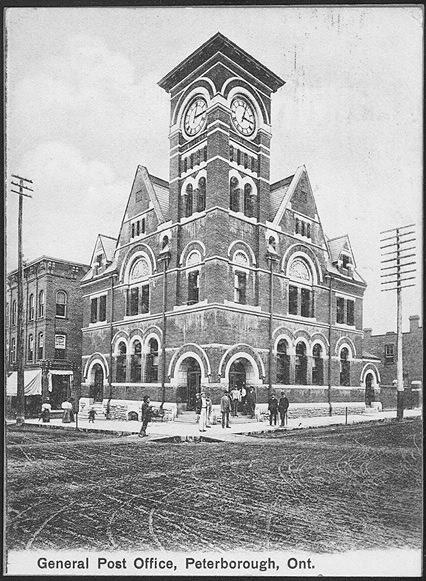 The post office would eventually open, on the corner of Hunter and Water Streets, but not until 1888. Apart from that, things were relatively quiet. 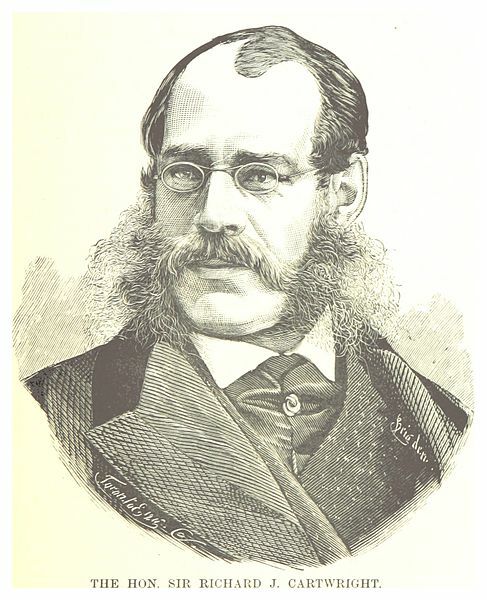 James Stevenson was chosen on December 28th as the mayor for 1886, but as there was nobody running against him the decision was made without any fuss at all. And that leaves us with only the matter of how Peterborians were ringing in 1886! There were a number of options available for New Year’s Eve entertainment. The “lady friends of the Y.M.C.A.” were hosting a reception, as was the Ladies’ Aid Society of George Street Methodist Church. If those options were not to one’s taste, there was a party being held at the Parlor Roller Rink on Water Street, music to be provided by the Fire Brigade orchestra. 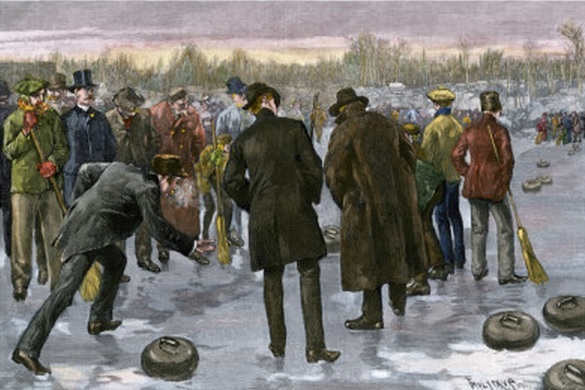 And of course, there was skating and sledding, and as much curling as anyone could want (curling seems very much to have been the Peterborian winter sport of choice at this time – organized hockey would not arrive in the town for at least a few more years). Finally, popular Vancouverite entertainer Harry Lindley was in town with his company, putting on a production of Sleeping Beauty at the Bradburn Opera House. An ad in the December 28th Examiner described the play as “[a] Cyclone of Frollicking Fun” and “[a] Carnival of Bewildering Beauty” – high praise indeed! Because of the format of this series, we have arrived at a sort of odd pass. Next week’s post will examine the opening days of 1886 — in other words, we’ll be looking at events that took place the week after the ones in this piece. 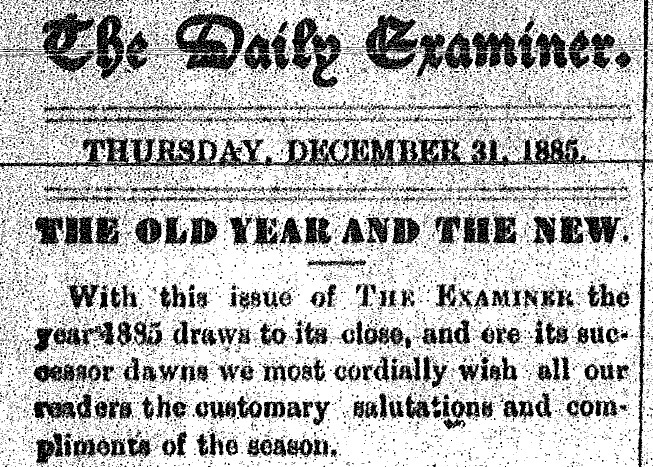 We will also be looking at them through the lens of daily, not weekly, newspapers – the Examiner had made the switch in 1885, and was by this time putting out six issues a week. Until then, a very Happy New Year to everyone!